I’m really pleased to announce a give-away by Karashilp for my Facebook viewers. KaraaShilp means “Hand Craft”. Hand crafts are a dying art. 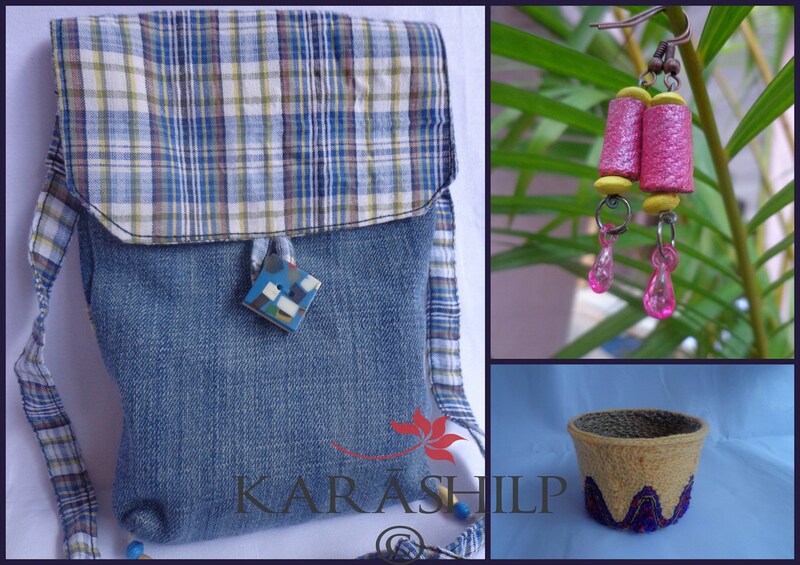 Through KaraaShilp, we wish to revive the interest and appreciation for meticulously and lovingly made handcrafted products as also fuse western and Indian crafts to make contemporary lifestyle products. Also going the green way, KaraaShilp upcycles/recycles materials wherever possible. 1st September marks their first anniversary and to celebrate that, Tanushree is gifting 3 karashilp products to one lucky winner!! A Denim Sling bag, a clutter keeper and a pair of denim earrings to be won. This contest is open till 4th of September 12 midnight IST. Winner will be chosen via lucky draw.